Perfect your swing and your hand-eye coordination by hitting ball-after-ball with the affordable Big League Portable Soft Toss Machine. The Big league includes a 12-ball auto ball feeder and is powered by a power adapter (included), or 4 C batteries (not included), or a Crusher 8hr battery (sold separately). The battery power feature and sturdy lightweight design make the Big League easy to move and transport. The Big League delivers the perfect toss every time, and allows you to put some real sting into your hitting game. 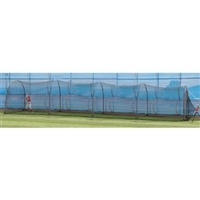 Big Play, the largest and easiest hitting and pitching net on the planet. The Big Play boasts a 7'x 8' hitting area and an easy to ste-up fiberglass frame for maximum strength and flexibility. 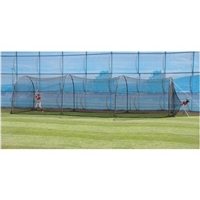 With the strong 1” poly netting the Big Play is perfect for baseball and golf use. Use with the Big League Soft Toss Machine because Big Play can catch anything. The Trend Sports Xtender 30 home batting cage features steel-tube side supports to give the frame durability and maximum swinging area for the player. The middle arch of the frame is constructed with a flexible fiberglass rod, which allows the cage to flex in the wind without bending or breaking. Its extra-strength 1" polypropylene netting is so small that it doubles as a golf cage, allowing you to practice your golf swing as well. The Heater softball pitching machine from Trend Sports provides a high-quality pitching machine at a low price. The powerful 1/4-horsepower motor throws softballs at variable speeds up to 50 miles per hour. Just turn on the feeder and each ball is dropped into the Heater every 15 seconds. This machine eliminates the need for another player at batting practice. Includes an automatic feeder that holds 9 softballs. 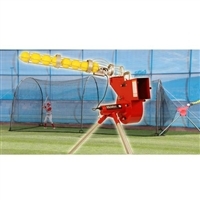 The Heater Baseball Pitching Machine w/ Free Auto Feeder is a heavy duty baseball pitching machine that pitches regulation real baseballs or baseball size 9" dimpled pitching machine balls. Features a steel housing and an adjustable pitch height, the Heater Baseball Pitching Machine delivers real ball speed and accuracy. A 10 speed variable dial allows you to adjust speeds from 15-50mph, based upon the standard Little League depth of 45' from the batter. The effective speed of the pitch can be increased by simply moving the machine closer to the batter, figuring 1.5mph faster for every foot closer to the batter If the machine is placed 40' from the batter, the effective top end speed will be about 58mph. The included AutoFeeder holds up to 12 real baseballs or 12 baseball sized pitching machine balls, delivering a pitch every 12 seconds. The Trend Sports Xtender 36 home batting cage features steel-tube side supports to give the frame durability and maximum swinging area for the player. The middle arch of the frame is constructed with a flexible fiberglass rod, which allows the cage to flex in the wind without bending or breaking. Its extra-strength 1" polypropylene netting is so small that it doubles as a golf cage, allowing you to practice your golf swing as well. No other pitching machine is as versatile and affordable as the Heater Pro Baseball Pitching Machine. With Heater Sports innovative Pivot-Head design you’ll be hitting outside breaking balls, inside breaking balls, and fastballs like a pro. And with the bonus auto-ball feeder, you can take a pitch every 10 seconds. The Heater Pro plugs directly into any standard wall outlet. The variable speed control allows you to adjust the wheel for a variety of pitches at speeds of up to 50 MPH. Use the Heater Pro with the optional PowerAlley or Xtender Home Batting Cages and you’ll be hitting balls anytime you want right in your own backyard. The Trend Sports Xtender 48 home batting cage features steel-tube side supports to give the frame durability and maximum swinging area for the player. The middle arch of the frame is constructed with a flexible fiberglass rod, which allows the cage to flex in the wind without bending or breaking. Its extra-strength 1" polypropylene netting is so small that it doubles as a golf cage, allowing you to practice your golf swing as well. The Combo Baseball / Softball Pitching Machine with Bonus Ball Feeder from Heater Trend Sports easily converts from one ball size to the other and is a great way to practice hitting and fielding techniques. The Combo Baseball / Softball Pitching Machine pitches slow or fast pitch softballs up to 56 miles per hour and baseballs up to 60 miles per hour. The automatic ball feeder holds 11" baseballs and 12" softballs, and lite-balls. Simply tilt the machine for practice catching pop-flys and grounders. The Combo Baseball / Softball Pitching Machine is a great tool for all skills. The Trend Sports Xtender 54' home batting cage features steel-tube side supports to give the frame durability and maximum swinging area for the player. The middle arch of the frame is constructed with a flexible fiberglass rod, which allows the cage to flex in the wind without bending or breaking. Its extra-strength 1" polypropylene netting is so small that it doubles as a golf cage, allowing you to practice your golf swing as well. The Heater Sports Softball Pitching Machine and Xtender 24 Home Batting Cage combo is a functional and effective way to practice hitting softballs in the privacy of your own backyard. Both products are easy to assemble and simple to use. After assembling the Xtender 24 Home Batting Cage, simply attach the Softball Pitching Machine to the provided harness, plug in the machine and begin practice. The Heater softball pitching machine features an automatic ball feeder that can deliver softballs up to 50 miles per hour. The tilt-design allows you to practice pop-ups, line drives and grounders. The Xtender 24 Home Batting Cage frame is durable and includes foam padding to protect it from powerful blows. It can also be combined with other Xtender Home Batting Cages to increase the length of the cage.